Seven Miles of Steel Thistles: Why The Owl Service isn’t as easy as a computer thinks it is. Why The Owl Service isn’t as easy as a computer thinks it is. My friend and fellow children's writer Cecilia Busby commented in a recent blog post for the 'Awfully Big Blog Adventure' on a computer-run reading scheme used in schools, Accelerated Reader. Developed as a guide for teachers and parents, the scheme assesses and grades books for young readers. It awards each title a number on a scale ranging from easy (around 3) to difficult (11 or 12), and encourages children to read by awarding collectable points for each title and providing quizzes to test their understanding. The scheme is popular and widely used, but Cecilia discovered some anomalies in its grading system. 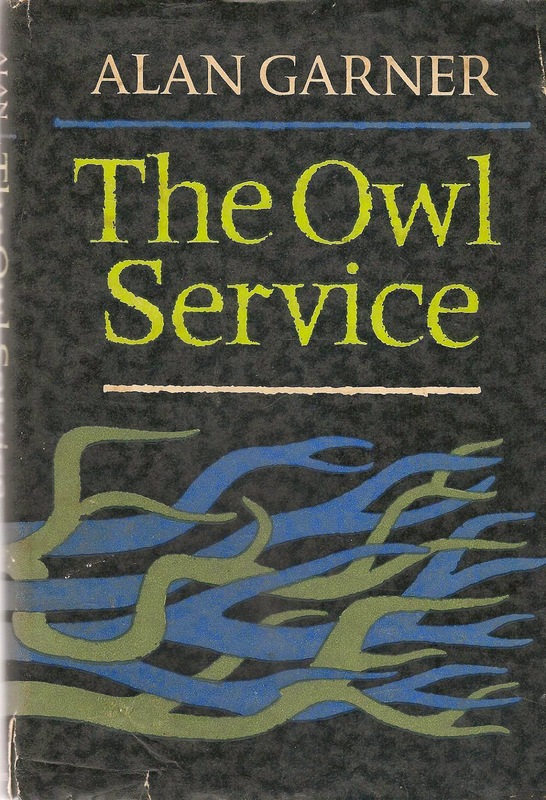 For example, Accelerated Reader grades Alan Garner’s 1967 book The Owl Service as easier for young readers than his debut novel The Weirdstone of Brisingamen. Anyone who’s actually read the books will know that this is bonkers. Intrigued, I took a closer look to try to find out how such a mistake could have been made. It seems the AR programme judges books by length, complexity of syntax and difficulty of vocabulary – including proper nouns. Although The Owl Service contains a number of ancient Welsh names such as Lleu Llaw Gyffes and Gronw, it can’t compare with The Weirdstone of Brisingamen’s whole bunch of unusual polysyllabic names such as Durathror, Fenodyree, Angharad, Llyn-dhu, Fundindelve, Cadellin, Atlendor, and of course the eponymous Weirdstone itself. Moreover, a glance at any page of The Owl Service will show a high proportion of dialogue – and consequently shorter, snappier sentences and simpler syntax – compared with the many long narrative paragraphs of The Weirdstone. So the dutiful AR computer has awarded The Owl Service a lowish 3.7 and banded it MY (Middle Years) for children aged 9-13, while The Weirdstone has been pushed right up to 6.3 and banded UY (Upper Years) for readers of 14 and over. The Owl Service is a far more advanced, difficult and sophisticated book than The Weirdstone, but the computer does not know this, because it literally cannot read between the lines. All the most interesting stuff in The Owl Service goes on in the spaces and silences and misunderstandings between the characters. And that’s the trouble. Reading isn’t just about understanding what words say. It’s also about understanding what they imply. Gwyn stuck his head round the door. Alison sat in the iron bed with brass knobs. Porcelain columns showed the Infant Bacchus and there was a lump of slate under one leg because the floor dipped. ‘Don’t put yourself out for me,’ said Alison. He rode sideways down the banisters on his arms to the first floor landing. He ran back. Alison was kneeling on the bed. The house was quiet. Mostyn Lewis-Jones was calling after the sheep on the mountain: and something was scratching in the ceiling above the bed. This apparently effortless piece of text provides immense density of information: but it takes time to unpack. 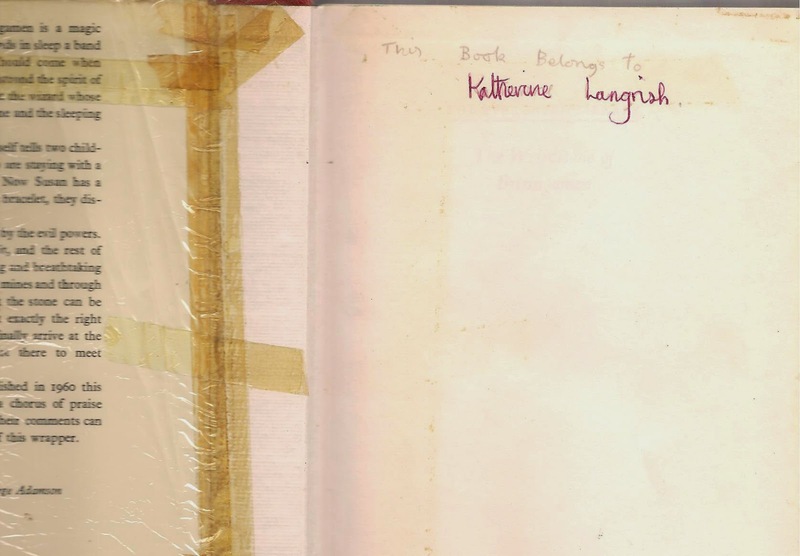 We learn – if we are really thinking while we read – that the scene is set in a bedroom on the top floor of an old Welsh house (the uneven floor and the old brass bed); we learn that the weather is hot, probably summer; we learn that the house is situated among mountains where sheep are reared. 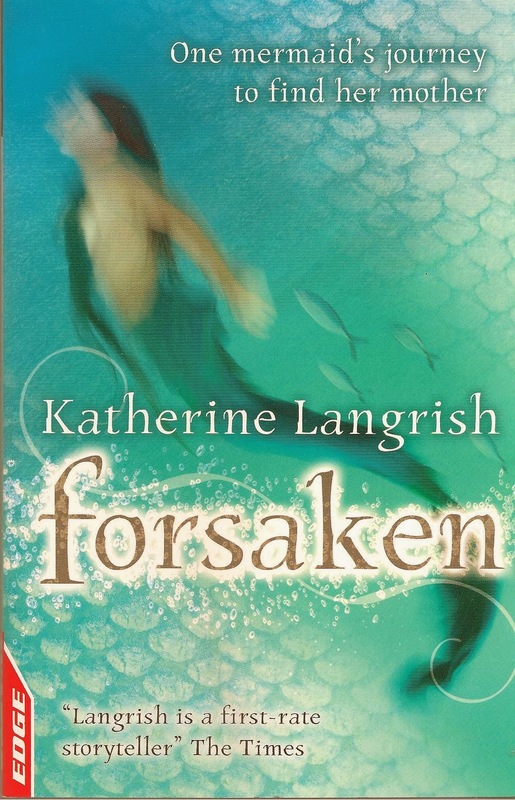 We are introduced to three main characters by name, and we see that while the unseen Roger has gone swimming, Gwyn is interested in Alison. He brings her a book and asks how her tummy-ache is (perhaps she has period pain; they must be teenagers) and, pseudo-casually, asks if she wants his company. When she reacts ungraciously, he pretends not to care – only to speed back upstairs to her side as soon as she calls him, to listen to something scratching up in the ceiling. No inexperienced reader is going to ‘get’ all this – or any of it – or be especially interested if they did. Imagine a younger child deciphering ‘what happens on the first page’ without understanding the subtext. ‘A girl is sick in bed. I don’t know what all the stuff about porcelain columns and Bacchus is supposed to mean. A boy brings the girl a book which he says is boring. They talk a bit. Then he goes downstairs and then she calls for him and he thinks she’s going to be sick, and then she tells him to listen to a scratching noise.’ On the surface, little is happening. It could seem disjointed, confusing, dull. Like the very grown-up tale from the Mabinogion which inspired it, The Owl Service is about nothing if it is not about relationships, and Garner expects the reader to work at the implications of his prose. He rarely tells us what anyone thinks or feels, or what they look like. But it’s all there. Susan began to clear away the debris of the journey – apple cores, orange peel, food wrappings, magazines, while Colin pulled down their luggage from the rack. And within three minutes they were both poised on the edge of their seats, case in hand and mackintosh over one arm, caught, like every traveller before or since, in that limbo of journey’s end, when there is nothing to do and no time to relax. Those last miles were the longest of all. The platform of Wilmslow station was thick with people and more spilled off the train, but Colin and Susan had no difficulty in recognising Gowther Mossock among those waiting. As the tide of passengers broke round him and surged through the gates, leaving the children lonely at the far end of the platform, he waved his hand and came striding towards them. He was an oak of a man: not over tall, but solid as a crag, and barrelled with flesh, bone and muscle. His face was round and polished; blue eyes crinkled to the humour of his mouth. A tweed jacket strained across his back, and his legs, curved like the timbers of an old house, were clad in breeches, which tucked into thick woollen stockings just above the swelling calves. 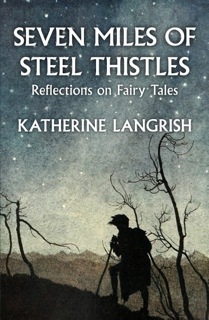 A felt hat, old and formless, was on his head, and hob-nailed boots struck sparks from the platform as he walked. Fifty-five years after it was written, these long sentences might strike a modern child as a bit slow, but they present few challenges and there is a reassuring sense of direction: when they get off the train, very soon, an adventure will begin. True, the train isn’t quite like a modern train, and children might not now (did they ever?) divide tasks quite so readily into ‘girl clears up the litter and boy lifts down the cases’ – and ‘limbo’ and ‘mackintosh’ might conceivably puzzle some young readers. Still, the first half-page is a straightforward narrative, while the second half is an equally easy-to-follow description of Gowther Mossock – perhaps a little lengthy, but Gowther’s solid dependability renders him an important emotional anchor in the adventures that lie ahead. 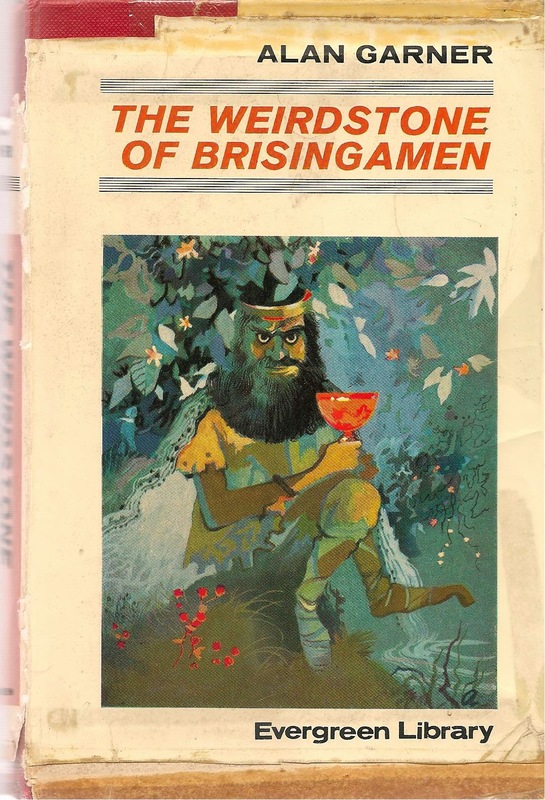 For The Weirdstone of Brisingamen is of course not about relationships. Though there are few signs of it in that conventional opening, the book is a fiery, frosty fantasy which burst upon my twelve year-old consciousness like a firework of marvels, magic and excitement. In those days even children expected a book to start in a leisurely manner and to gather momentum as it went along, but it is still a far more accessible story for a young reader than The Owl Service can ever be. For a writer to progress from The Weirdstone of Brisingamen to The Owl Service in seven short years (1960 – 1967) was to display extraordinary talent. Alan Garner is one of our greatest living writers. But I need to confess in this context, that as a young reader, I couldn’t keep up. And I was a really good reader, a child who read all day, every day. I devoured at least ten books a week. I was probably ten or eleven when I first read The Weirdstone, and over the next few years I read it and its sequel The Moon of Gomrath (1963), and Garner’s third children’s book Elidor (1965) multiple times, and secretly began writing Garner-inspired fiction of my own. But I wasn’t progressing as a reader at the same speed that Alan Garner was progressing as a writer. He was accelerating away from me, and with Red Shift in 1973 seemed in fact blue-shifting from children’s into adult fiction. When I first read The Owl Service at the age of 13 or so I found it dry and spare and difficult. I looked in vain for the colour and richness of the earlier books, and its pared-down dialogue was wasted on me. If The Owl Service had been the first book I’d read by Alan Garner, I doubt if I would ever have tried his others. And that would have been a great shame. But the computer goes by rule-of-thumb. The computer looks at syntax and vocabulary. The computer thinks The Owl Service is for children of 9 to 13 and The Weirdstone of Brisingamen is for teenagers of 14 plus. I’m not mocking. Friends assure me that the AR programme really does encourage schoolchildren to read, that many of them like the element of competition and enjoy amassing points for the titles they read. So long as they are also enjoying the books themselves, that’s good. But parents and teachers should know that the system isn’t foolproof. The computer which assesses and grades these titles cannot actually read – in a human sense – at all. A computer can never replace an experienced librarian. No point in me trying to add anything, Kath - you've said it all! The AR system sounds a bit like something we have here called Lexiles. My school used to use it, but the kids really got more out of a teacher-librarian-based program called Ribit. It had the stars and quizzes and such and relied on the librarian to decide what the kids could handle. There was no computer involved. My school now runs a classroom-based program we call SunLit - it works, I teach it - and in the library I run a book club and look after all the kids who borrow. When I student-taught at a school that required all the students to participated in the AR program (they received grades based on their points), I noticed that most of the kids would *only* read books that were included in the program. It wasn't worth "wasting" their time on any others. Kind of a sad testimony to the way reading can be undermined by good intentions! That IS sad, Anna. And Sue, yes - that was part of my point, sadly. We're losing librarians, and the idea that a computer programme can replace them - well, it just can't. I suspect that Red Shift would be rated as even easier than The Owl Service, which boggles and appals. And yet, and yet... While agreeing with all about this programme never being able to replace a good, knowledgeable librarian... If it gets some children into the habit of reading, so they practice and become more fluent - and if they get some enjoyment from what they read, even if they don't want to 'waste' reading time on a book not in the scheme... Might it still not lead some children into reading more widely who otherwise wouldn't have done so? Because without this scheme, they wouldn't have had the practice, and reading would have remained something a bit difficult and boring which other people did. I much prefer the sound of Sue B's librarian led scheme, though. As a university librarian with responsibilty for a wide and varied collection of children's literature,from picture books to fiction for children up to age 15 or 16 which is used largely by our trainees teachers. I find increasingly that they will only borrow books which have been either recommended by lecturers or are on their module reading lists. They are less and less inclined to browse the shelves, or read "outside" the narrowest selection of recommended authors. It's true we're losing librarians, but what is worse is that we are rapidly losing librarians who care about books! For many computers rule the day, shelf space and the budgets!! Hear, hear! A perfect example of why schemes should not be used in isolation. That's the thing, Becca. I'm sure as Susan Price suggests, this scheme does get some children interested in reading who might not otherwise; but it's never going to replace a knowledgeable librarian - or parent or big sister - who really knows and loves the books and also knows the child. An afterthought about these two passages. This business of a slow lead-in to a children's story is currently unfashionable among publishers - 'grab the reader on the first page' is the mantra. We are supposed to cater to the short attention spans of a TV age, short sound-bite culture. Yet the slow lead-in of 'The Weirdstone' allows a child reader to accustom her or himself to the world and characters of the book - while in 'The Owl Service' the reader is dropped into the middle of an unexplained situation and left to work out what's happening from dialogue cues. Snappier, faster, but far, far more sophisticated and difficult. Nice post Katherine. I re-read Weirdstone only a couple of weeks ago and it still stands up. The thing about AR is that it can't really be run properly without an experienced librarian. I don't think the people who created it would claim that it could replace a librarian. The system, with its quizzes and lists, needs careful supervision and monitoring. And when you get the AR/librarian combination, it can have amazing results. My youngest son is a good example of how an experienced school librarian, using AR can change reading habits and boost confidence. That's good to hear, Jon! A computer once tried to analyse my writing style. I ate its CPU with some fava beans and a nice Chianti.